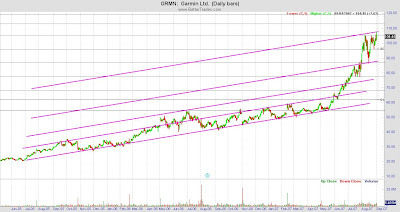 This is the trend that I see for GRMN over the past 2 yrs. Even though it's had this steep rise in the past 3-4 months, it's still following the same angle of attack. Yes, I know, Tim would use the log scale to make this proportionate. My thing here is I'm a profitable trader using an arithmatic scale and that's what I know. So, I'll stick to that. This can't be seen from either charts because it would make it look not so great, but the upside targets would be: 112.90, 119.30, 124.10, and 130.60. I haven't gone beyond those, but for those following this stock, let's see how close I get. These would be points of retracement or reversal. My indicators, maybe someday I'll post these, shows bearish divergence for MACD and RSI. However, it also shows that there is still upside potential possibly left and looks to be possibly in an oversold situation. Let's see which it is. The bracket I have for an upside entry (if I were to play this stock) would be $109.50 and downside entry would be around $101.75. 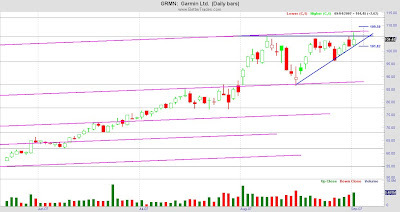 This seems to be trading into a wedge - higher lows. Can you see it? This is a type of compression pattern, however, it doesn't seem like volumes are lightening up. Perhaps not. We'll see. I would probably do a $3-4 stop from whatever entry there is. Cashflow seems to continue to rise, but it's awfully high. There seems to not be a lot of momentum left. This is just what I'm seeing for this stock.